Well. Let's start with the most fundamental: it's big. 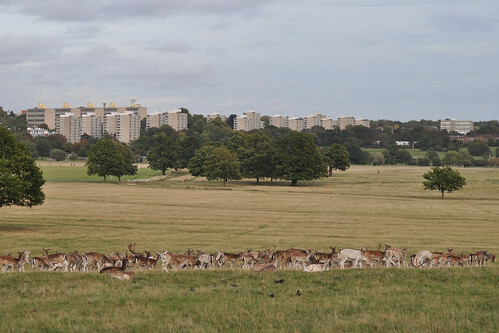 This is London's largest Royal Park (955 hectares / 2360 acres); what these numbers mean in reality is big enough that you can quite easily find yourself unable to see any trace of city - or even other people, on a quiet day - just rolling grassland and trees for miles in all directions. Such a statement may seem a little unwhelming to readers in rural areas, but in London you can't take this for granted. 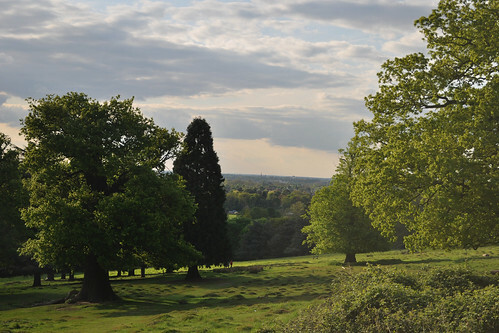 Most London parks always feel like city parks: some of them are highly manicured, have a pretty high "population density", and/or in all but a few small or contrived spots, you can always see and hear the surrounding city. 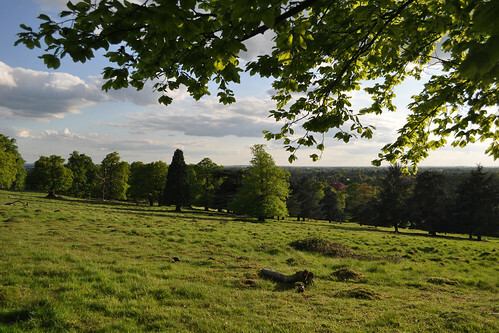 Here, you can walk around extensively and completely lose yourself in greenery - and while the park is clearly managed and it would be naive to call it "wild", it certainly isn't a garden. Mind you, I should probably qualify this "you can forget the city" claim. 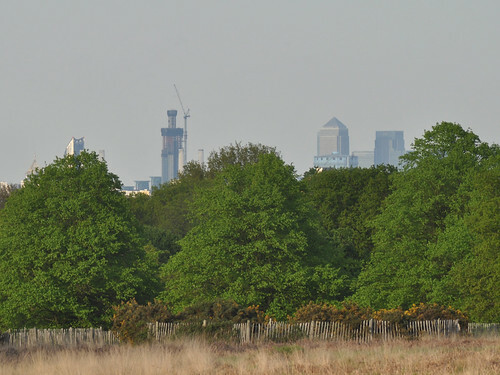 Having lived underneath the Heathrow flightpath for years I now automatically tune out the constant stream of overflying jets coming in to land; my parents, when they visited, could not! 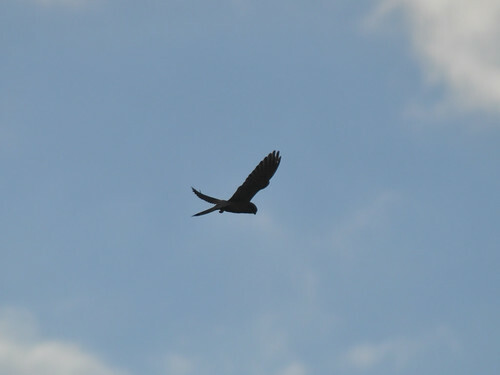 Turns out I don't really have any photos which embody this "big" quality. The best I could muster is this old point-and-shoot shot. 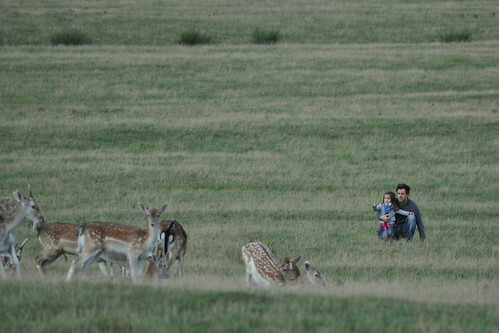 The other obvious attraction is the free roaming deer. 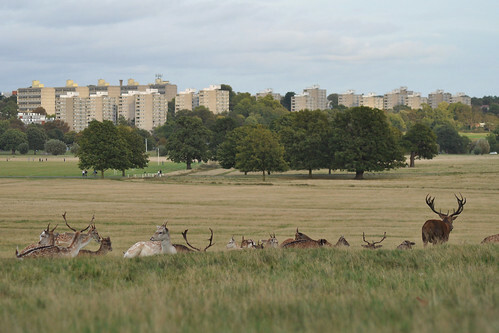 A legacy of the Park's history as a royal hunting park, there are currently about 300 Red deer and 350 Fallow deer. 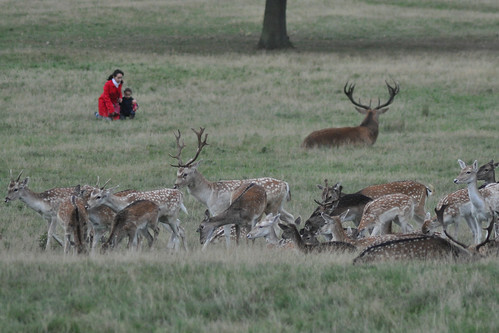 They are wild animals; although fairly tame, no doubt tamer than deer living in a truly wild environment, they do not allow people to approach them to touching distance, in my experience. They are also famously spooked by uncontrolled dogs - FENTON!!!. 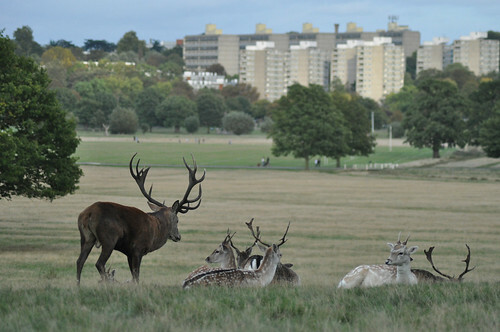 That said, lacking natural predation they are culled each year to maintain sustainable population levels, so perhaps we could save the park-keepers a job by simply letting dogs savage them at will. (I jest, of course). Of course, it's not just deer. 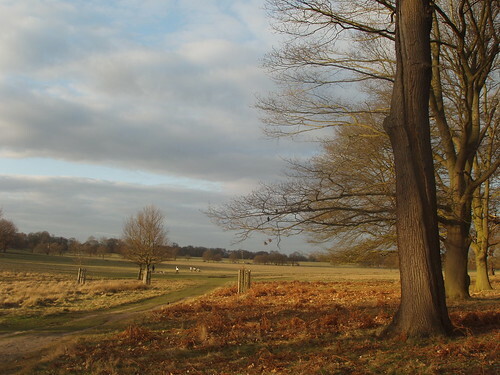 A Site of Special Scientific Interest, the Park is particularly rich in beetles, apparently. A rather more noticeable sight are the bright green Rose-ringed parakeets, a tropical Afro-Asian parrot which has established urban populations across Europe, Japan, USA and elsewhere. 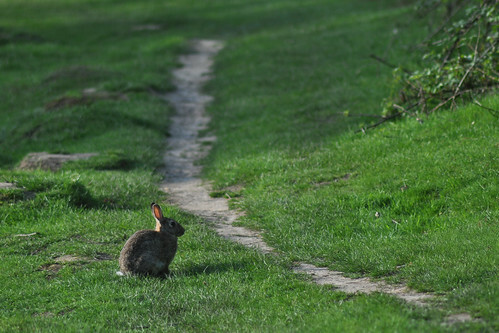 There are also hovering birds of prey (not sure exactly what kind) and your usual selection of rabbits, squirrels and the like. 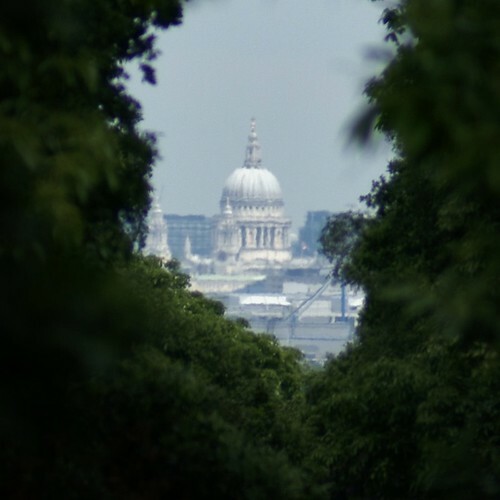 I earlier hailed how easy it is to find yourself unable to see urban London. 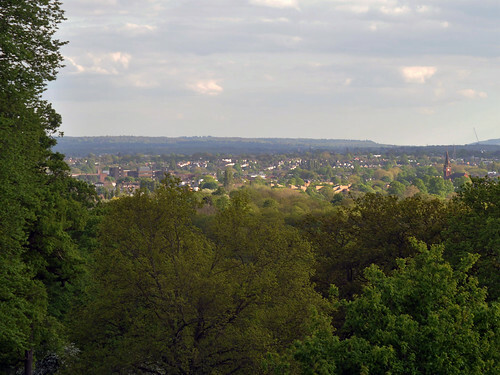 However, the reverse is true as well - the Park has a few great views over the city. 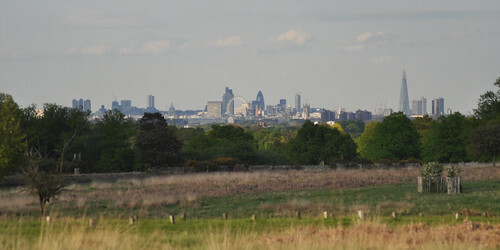 As a fan of skyscrapery skylines, looking roughly north-east from Sawyer's Hill affords a nice, if somewhat distant, view of London's. 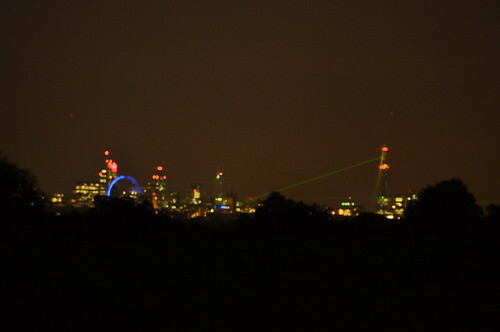 This is also where I went to view the laser show for the "opening" of the Shard. I was unsure if I would be able to get in at that time, since the Royal Parks' website does its best to tell you the park closes at dusk. 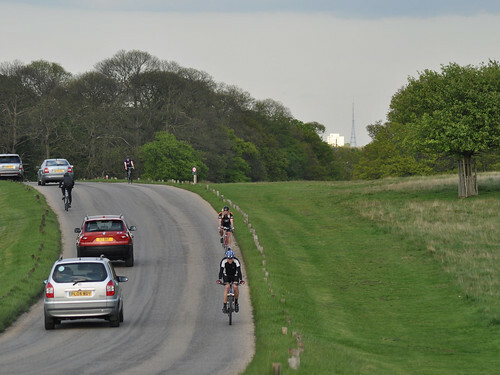 However, I was sure that some of the roads across the park were public rights of way, and I couldn't therefore see how they could reasonably prevent me from entering. A little googling led me to the story of John Lewis, a Richmond brewer who went to court in 1758 to conclusively establish the established pedestrian rights of way could not be restricted, 24/7. Sure enough, nothing prevented me - and at least 50 other people - from gathering on Sawyer's Hill that night. Sadly, the results were underwhelming. With the naked eye it was barely possible to pick out the lasers at all. On long exposures they were visible but lacklustre, and I lacked the skills or gear to capture it sharply. The only tube to come near the park is the district line to Richmond station, and likewise for the Overground. There are various other stations along the Richmond - Waterloo national rail line which are walkable (see right), but none of them are particularly close. Whichever station you arrive at, you can expect to walk at least 15 minutes to a park gate. You could go to Barnes and walk up Priory Lane, past the rehab centre of the same name, and the National Tennis Centre, with the rather odd "athlete or trainwreck" celebrity-spotting possibilities that implies. 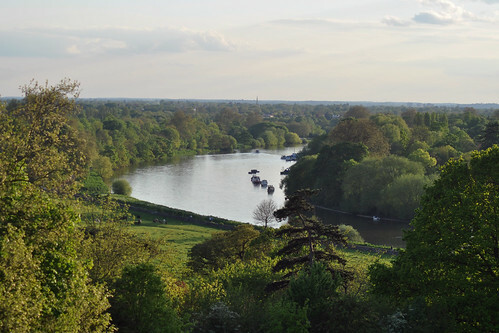 However, if you're visiting from somewhere not too local, I would probably recommend Richmond. Not only does it have the widest array of connections, the walk from the station to the gate is rather attractive in itself. 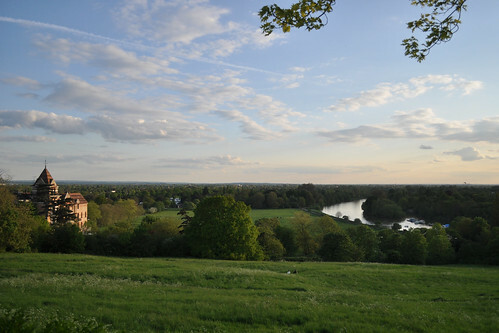 Ascending Richmond Hill, the vista over Petersham Meadows, the Thames and the suburbs beyond is the only view in England to be protected by an Act of Parliament - the Richmond, Ham and Petersham Open Spaces Act passed in 1902.